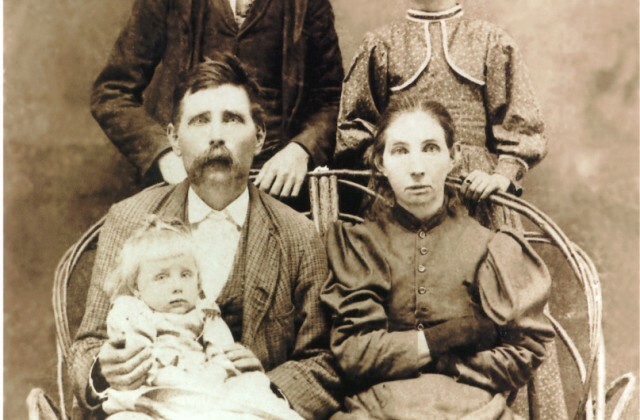 William Perry is seated holding his daughter Jessie (b. 1897), wife Sarah on the right. Standing behind are Oscar (b. 1883) and Eula Belle. Not shown are the three oldest children, Albert Winston Lang b. 1869 who married Narcissus Lang, Charles F. Lang b. 1874 who married Rosa Lang (first cousin), William L. Lang b. 1878 who married Lula Holmes. The photo is circa 1898. William Perry LANG, son of James W. LANG, b. c. 1814-1820 at Kemper Co., MS, and Annie Adeline BROWN, was born 1847 and died 1936. James J. LANG, a brother of William Perry LANG, married Mary Ann “Daught” SIMMONS, a sister of Narcissus SIMMONS who married Albert Winston LANG, son of William Perry. William Perry married Sarah PHELPS, a step-sister, daughter of Marshall PHELPS and Caroline PARKER. She was born 30 Nov 1853, Newton County, MS., and died 30 July 1901. 1) Albert Winston b. 20 Oct. 1869, d. 17 Feb. 1959, married Narcissus SIMMONS. 2) Charles F., b. 8 April 1874, d. 1944, married Rosa LANG, a daughter of Columbus W. LANG and Martha THIGPEN. They had one daughter, Ina, who married Leo PAGE and died without children. Charles is buried at the Union Baptist Church Cemetery at East Magnolia. 3) William L. “Will” b. 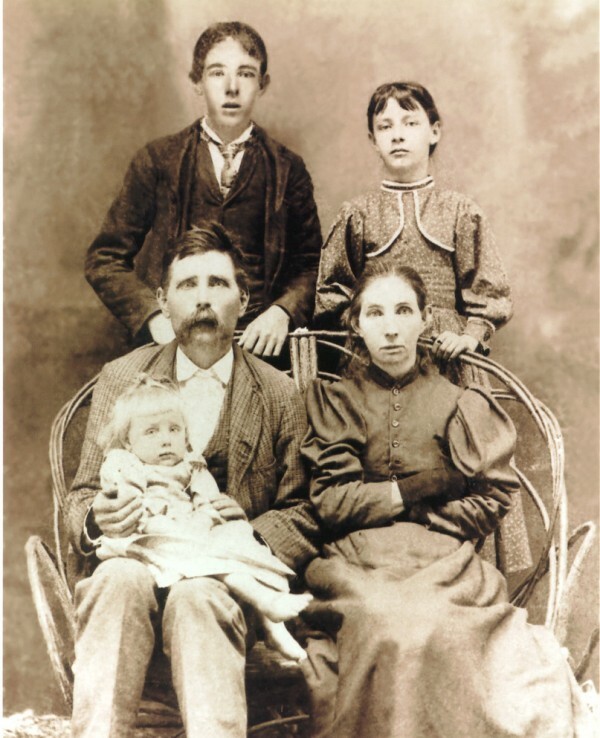 21 April 1878, d. 1944, married Lula HOLMES, and their children were Felton, Beulah and Elizabeth. William is buried at the Union Baptist Church. 4) Oscar L. b. 17 Sept 1883, d. 1950, married Nellie MATTHEWS. He is buried at the Union Baptist Church Cemetery. To them were born: Sarah, who married James FOREMAN, had six children; Mattie married Roy KUYRKENDALL and had three children; Barney married Jessie Elizabeth NASH and had two children; Frank married Nettie FENUSCI and had no children; Bessie married Ray TISDALE and had six children; Hellen married Ted TANNER and had two sons. 5) Eula b. Dec. 19, 1887. Jessie b. 22 June 1897, married Edward LANG. Edward LANG was a son of Columbus W. LANG and Elizabeth THIGPEN. Columbus W. LANG was a brother to William Perry LANG. Jessie and Columbus had five sons and three daughters: Alfred “Pete”, Joel, William, Charles, Aaron, Nellie, Ruth and Ione. After the death of Sarah PHELPS, William Perry married 2nd Ella MATTHEWS, who had already two children, Ethel and George SMITH. 1) Barney C. “Billy”, b. June 12 1903 when William was abt. 56. He married Retha STERLING. They had no children. 2) Nella, b. March 4 1906 when William was abt. 59. She married Prentiss CASE; no children. 3) Polly, b. in 1908 when William was abt. 61. Died young. Ella Lang, second wife of William Perry Lang, is buried in the Lang-Simmons Cemetery just off LA Highway 10 in Sheridan community, located between Bogalusa and Franklinton.